Brief Synopsis – A small time criminal in fascist Italy during the early days of World War II does all he can to survive while trying to keep his honor and the honor of his family. My Take on it – This is a film that I knew absolutely nothing about before watching it. I am not the biggest fan of many Italian films because they are usually much more abstract in their stories, but this one hits the mark perfectly. Giancarlo Giannini is perfectly cast in the lead and manages to keep things interesting the entire time. He was quite deserving of his Oscar nomination for Best Actor for this role. The storyline is all about survival in desperate situations and we are given so many occasions to watch how the characters do just that. The story is told mostly in a linear fashion, but there are times where it skips around in time to give us a better understanding of everything going on and it works really well that way. 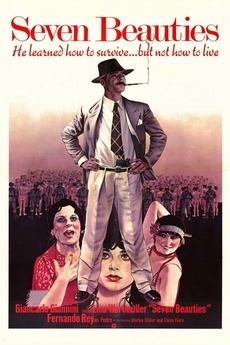 Director Lina Wertmüller became the first female director to get an Oscar nomination for Directing with her work on his film and she was quite deserving of that since she does an amazing job with this story that is dramatic and comedic at the same time. Bottom Line – Interesting story that show the lengths some people will go to in order to try and survive desperate situations. The story is told very well and I liked how it works in a semi non-linear fashion in order to help us understand the overall storyline and how things get to where they do. Giannani is great in the lead and was very deserving of his Best Actor Oscar Nomination. Wertmüller also does an amazing job directing this film and she was quite deserving of being the very first female director nominated for an Oscar. Highly Recommended!